Kettlebell core exercises will reduce back issues, increase your resilience and improve the look of your midsection. The following 7 floor based kettlebell core exercises are an excellent addition to your existing workout program or they can be used as stand-alone workouts. Why Use Floor Based Kettlebell Core Exercises? Kettlebell training is notoriously effective due to the large amounts of dynamic muscle recruitment you achieve from each exercise. As your core muscles basically provide the connection between the upper and lower half of your body most kettlebell exercises use the core muscles to some degree. When using the below 7 kettlebell core exercises your core muscles can fatigue quickly. If you attempt big or heavy lifts after these exercises then your core muscles may not be able to stabilise your spine as well as they should. You are always better to perform intense core exercises at the end of a workout or on a day when you are not performing any other exercises. Select 2 – 4 core exercises from below and put them together into a circuit. Perform your kettlebell core workout 1 – 3 times per week depending on what other exercises or activities you are involved with. 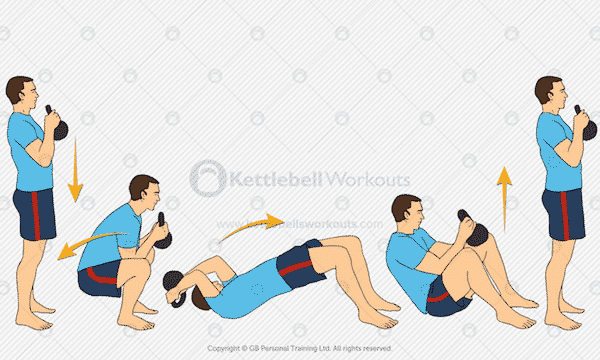 The kettlebell half get up is an excellent rotational core exercise for both the abs and oblique muscles. 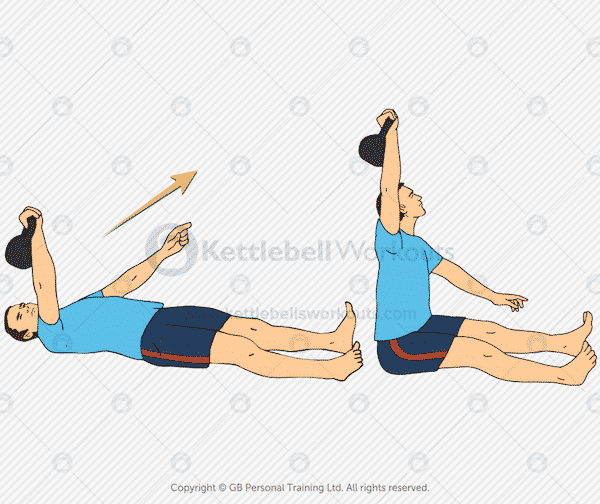 Not only will you get some great core activation with this exercise but it will help you to develop better shoulder stabilisation for other overhead exercises. During this exercise you are sitting up by using a combination of your core muscles and support from the non kettlebell arm. Care should be taken to avoid too much hip flexor activation by keeping the outstretched leg and heel on the floor at all times. If your foot pops up as you sit up then your hip flexors are working too hard. Think about sliding the foot away from you as you sit. Keep your arm straight and eyes on the kettlebell at all times. When you come to lower yourself from the top position move slowly allowing your core muscles to eccentrically lower you under tension. Don’t just drop back to the lying position. Get started: work up to 6 reps on one side without putting the on the floor, then switch sides and repeat. Work your weakest side first and then match that number on your strong side. The kettlebell sit and press is a challenging exercise that will work your abs as well as your shoulders and general mobility. With the legs straight sit up keeping your heels on the floor, if you suffer from tight hamstrings then you will find your knees bending slightly. As you rise push the kettlebell up and overhead with both hands. Keep your chest up and sit tall, don’t allow your upper body to slouch forwards. As you lower from the top position allow your ab muscles to resist the forces of gravity. Try lowering to a 3 second count or longer. Get started: 10 reps is a great target with a 3 second lower for each repetition. The kettlebell hip thrust will help to develop the abdominals from top to bottom while at the same time improving pelvic stability. 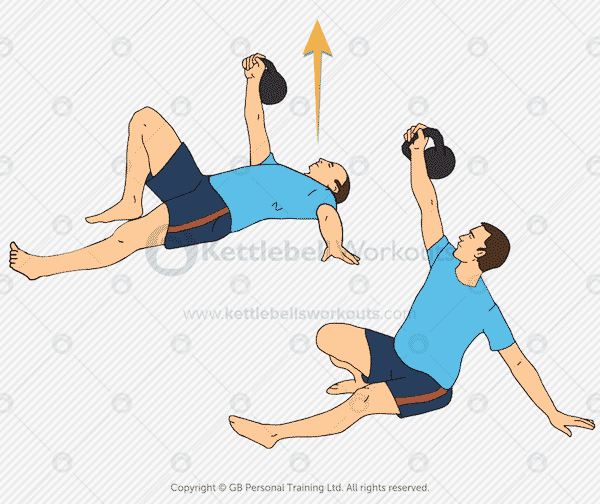 Begin by lying on your back with your legs in the air and both hands outstretched holding a kettlebell. During this exercise the kettlebell position should not change. Next push both feet directly up towards the ceiling, if you can pick a spot on the ceiling to target with your feet then that is helpful. The challenge with this exercise is to NOT rock your legs back and forwards but to push them straight up and then back down. Your buttocks should come up off the floor as you push your feet upwards. Move slowly and deliberately avoiding any kind of rocking movements, the further forwards you push your feet upwards the more challenging the exercise. Get started: 8 – 15 reps is a great target but ultimately if you start losing form then you should stop. 5 great reps is better than 15 bad ones. The kettlebell full Turkish get up is the ultimate total body exercise that targets all aspects of the core muscles. Not only will the Turkish get up condition all aspects of the core muscles but also strengthen the majority of the stabilising muscles from head to toe. The get up will also help to integrate many of the core muscles with important movement patterns making your movements far more resilient to injury. 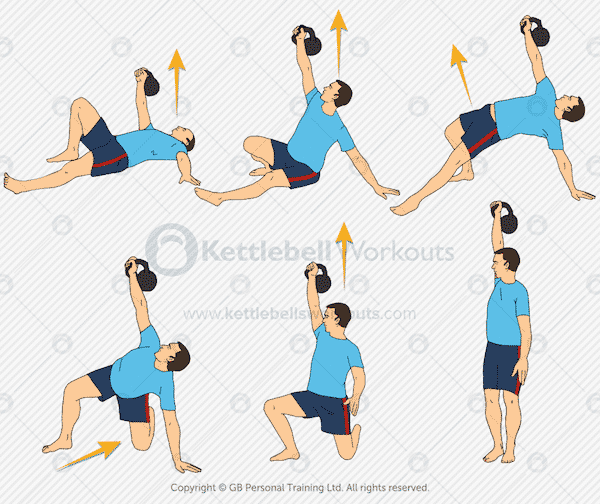 Having mastered the kettlebell half get up (exercise 1) you now progress the movement all the way to the standing position before reversing the steps back to the lying position. The full Turkish get up serves as an excellent assessment tool for a handful of important movement patterns. Should you find one section of the Turkish get up particularly challenging then you should spend time improving the movement. Failure to improve on weak sections of the Get Up will lead to problems during other activities. Get started: practice without or with a very light kettlebell before challenging yourself. Start with 1 repetition on each side. Progress to a total of 10 reps, changing hands each time. 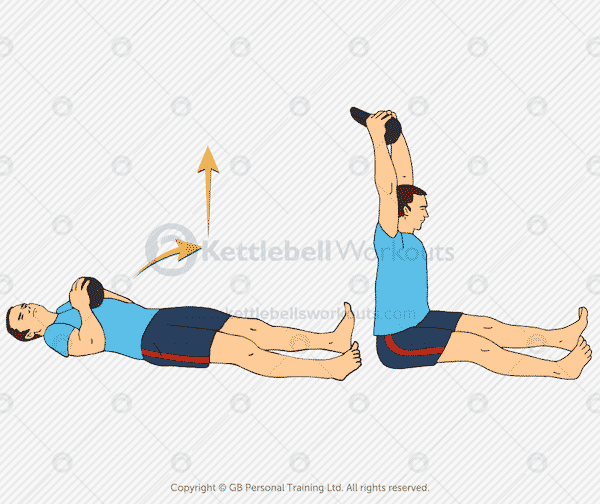 The kettlebell straight arm sit is a challenging exercise that conditions the abdominals as well as the oblique muscles. Weakness in the core muscles will see the hip flexors try to take over and you may find your feet shooting up into the air. Keep the legs straight and think about driving them forwards along the floor. You can use the kettlebell to assist you with this exercise by allowing it to fall slightly forwards of the midline and therefore pull you out of the initial sticking point. As with all these kettlebell core exercises the downward phase back to the lying position should be achieved under control. As a guide 2 – 3 seconds of lowering is optimal. It is important to keep the kettlebell arm straight or you will exhaust your shoulder before your core muscles. Get started: as this is a challenging exercise repetitions will be kept low, aim for 3 – 8 reps each side. 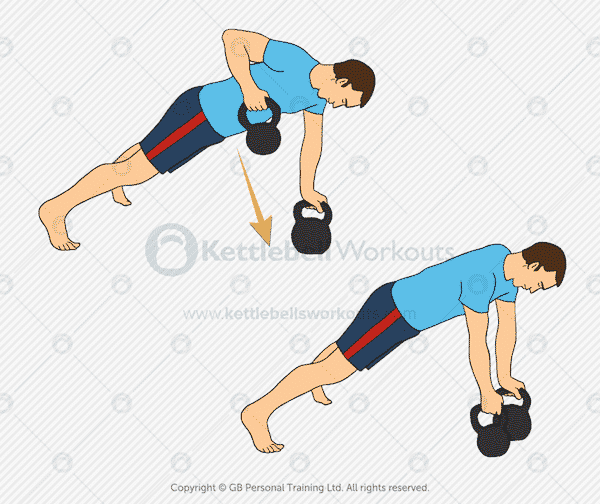 The kettlebell renegade row is an advanced kettlebell exercise that works the core stabilising muscles as well as strengthening the back, shoulders and chest. There are two challenging phases to this core intensive exercise. First you need to be able to stabilise your spine in the plank position. Beginners should practice holding the top part of the push up position for a minimum of 30 seconds. Your body needs to stay straight from head to heels and your hips should not drop towards the floor. The second phase is rowing the kettlebell towards the body generating counter rotational forces through the core muscles. Row the kettlebell pulling from the elbow and keeping your shoulders away from your ears. Pay particular attention to the lowering part of the exercise, fight gravity and lower under control. Get started: beginners should be able to hold a plank position for at least 30 seconds. Keep repetitions low, 5 – 8 reps is a good target. The kettlebell deck squat is a fun full body exercise for the core muscles. The most challenging part of this kettlebell core exercise is getting your hips underneath you before standing back up. For this phase the kettlebell is your friend and you should use its momentum. If you struggle with standing then practice sitting in the bottom part of the deep squat position with the kettlebell held in both hands for balance. Kettlebell core exercises are a great addition to any workout schedule. You can reduce your potential for injury, eliminate back problems and improve the look of your core and midsection. Although most standing kettlebell exercises use the core muscles these floor based exercises add a little more intensity to the core. Above I have listed 7 kettlebell core exercises for you to try, some are more challenging than others. Try to always perform exercises within your capabilities to ensure your form is spot-on and you don’t create faulty muscle recruitment. Have you tried any of these kettlebell core exercises? Let me know more below….